The suggested readings are about the creation, the original state of the fall and the promise of salvation in our Lord Jesus Christ. Take heed and learn! Now is the time for your re-creation. Embrace the Lord, and He will give you light which will enlighten your sinful darkness; He will set a firmament amidst your restless thoughts and the desires of your sin-loving heart — the good intention to firmly and steadfastly work for Him. He will establish dry land and the sea, and will give everything its place within you. 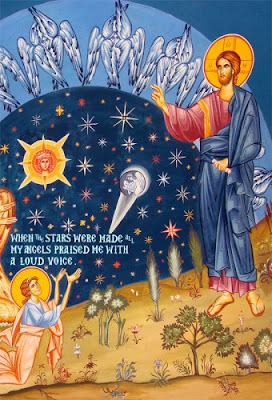 Then you will begin to bring forth first herb, grass and trees — the first fruits of the virtues, and then living creatures - perfect spiritual and God-pleasing works; until at last the image and likeness of God is restored in you, as you were created in the beginning (cf. Gen. 1–26). All of this will the Lord create for you in these six days of spiritual creation, which is your preparation for Holy Communion, if you will pass this time with attention, reverence and contrition of heart. In St. Theophan’s time it was a widespread custom in Russia for people to spend the first week of Great Lent preparing to receive Holy Communion on Saturday. This preparation, in Russian called govenie, involved fasting, attending Divine Services, reading prayers (including canons, akathists, etc. ), doing prostrations and engaging in other spiritual activities, instead of going to work. On the Friday of the first week of Lent, people would go to confession. Thus, when St. Theophan mentions the “six days of spiritual creation,” he refers to these first six days of Lent which were a preparation for Holy Communion on St. Theodore’s Saturday.